It is about infinite possibilities. And perhaps more than anything else, it's about optimism." Glimmer, page 16. Vern Burkhardt (VB): What led to your interest in writing an in-depth book about design? Warren Berger: I was writing a lot about advertising and marketing, and I kept finding that the conversation among smart business people was moving in the direction of design. People at top ad agencies like Crispin Porter Bogusky and TBWA Chiat/Day, or at brands like Apple and Nike, were starting to think of marketing more as a design challenge than a series of ad campaigns. So that got me interested in design in the business world, but then I also started to become interested in the potential of design in the social realm. With my book I tried to connect those different areas. VB: Glimmer focuses on "the kind of design that is engaged in the struggle to solve human problems…" Would you explain? Warren Berger: I find that when people talk about design, they're usually talking about it in one of two ways. Either purely as an artistic or stylistic pursuit which is the kind of design that ends up in museums and fashion shows, or as a means of solving real-world problems in innovative ways. I'm interested in the second kind of design. Not that there's anything wrong with "art design" but I just chose to write about design for the practical world. VB: Can your whole process when writing Glimmer, including your initial idea about it, be explained by George Kembel's five step design process. Warren Berger: I think so. Kembel, who's a leading design scholar at Stanford University, says designers tend to follow a circular process that involves framing a challenge, relying on empathy and deep observation to better understand that challenge, coming up with multiple options and ideas, creating prototypes of possible solutions, and then continually refining those ideas. But it doesn't have to go in that order. As I say in the book, you can "begin anywhere" – you might start with step three and then go to step one. As long as you do all of these things at some point, you're following the basic design thinking process. I did all of those things as I worked on the book, including lots of prototyping along the way. VB: What is a glimmer moment? Warren Berger: I describe it as the moment when the first sparkle of a new possibility becomes evident to a designer or creator. A lot of us find ourselves muttering, "There's gotta be a better way." The glimmer moment is when you light up and ask, "Hey, what if someone were to do it this way?" Of course that's only the beginning. Designers must turn those glimmer moments into actual realities. And what's fascinating to me is that they have a proven process for turning crazy ideas into realities. VB: You feature the ideas and approaches of many world-class designers, whom you call the "glimmerati", but emphasize especially the ideas of Bruce Mau, and refer to many of the 43 points in his "An Incomplete Manifesto for Growth." Why Bruce Mau? Warren Berger: When I set out to write Glimmer, I wanted it to be a bit like Freakonomics, only focused on design instead of economics. And I knew that part of the reason Freakonomics worked as a book was because there was a great central character – a brilliant, controversial economist named Steven Levitt. He was the "freak" in Freakonomics, and I decided Bruce Mau would make a good "freak" for my book. Mau is outspoken and iconoclastic. And he takes on really big, interesting design challenges. He also articulates the promise and potential of design better than anyone I've met. This is not to say everyone is a fan of Mau. He definitely has his detractors, but I kind of like that, actually. VB: Bruce Mau has said, "[design, at its best, can provide] a delightful and simple solution to a profound and far-reaching challenge." Given the number of solutions implemented by businesses and governments that do not fit this description, does this mean we need to increase the role of design and designers in these types of organizations? Warren Berger: Absolutely. Companies are just beginning to understand what design is really about; previously many thought it was just about logos and packaging. But design principles and strategies can be applied to every part of the business, and should be. And that's even truer with government. The kind of huge, complex programs that are undertaken by government cry out for thoughtful, holistic design. Yet most government programs seem as if they've been created piecemeal by bureaucrats. VB: "In the quest to appeal to a more fickle and demanding public, companies have used design to tinker with the functionality and form of new products… But missing from the design of many of these products was a sense of purpose…" What do you mean by a sense of purpose? Warren Berger: By that I mean, real usefulness, value, and relevance to people's lives. Many products fail to address the most basic question, "Why does anyone actually need me?" Instead, the company may be focused on how to jam in more features, or how to produce the product ever more efficiently. The role of designers is to challenge companies to step back and consider whether the things they're making are actually needed by people. And if not, then how can we redesign those things so they do begin to fill a need? VB: "The trend toward offering designed experiences… represents more of an evolution than a trend or fad; it has helped raise those companies out of the cutthroat commodity business." Is this more applicable to developed economies than to emerging ones? Warren Berger: Right now, yes. But one of the ways developing markets can begin to compete with the developed ones is if they start to figure out the importance of designing rich experiences. This is what will help them move beyond offering cut-rate commodities, just as it has helped certain companies do likewise. It requires an understanding of the subtleties and the holistic nature of design. Anyone can manufacture widgets – but a good brand experience must be orchestrated and designed. VB: You quote Brian Collins, founder of COLLINS – an experiential branding firm – who describes traditional advertising as a tax on laggards who haven't figured out how to design and deliver the best customer experience. Do you think customer's ability to communicate through social networks on the Internet will make traditional media advertising obsolete within the next decade? Warren Berger: Hard to put a timeline on it. But there is no question that traditional advertising is losing ground quickly. The days of "Mad Men" coming up with a clever line and plugging it into three forms of standardized media are pretty much over. Today's marketing campaigns are complex design projects. You must constantly invent new forms of communication, the latest viral delivery mechanism. This means you must prototype, constantly. As you're inventing all these new forms of communication, you must synthesize all the new pieces to make sure they work cohesively together. And that's design in a nutshell, which is why I think Chief Marketing Officers, and marketing people in general should learn a little bit about design thinking and how it works. VB: It may be a glimmer moment for some corporate leaders when they find that what they say in their advertising and other public statements must be consistent with their internal behaviors and business practices, because this information will become increasingly available to potential customers through the Internet. Will this drive more companies to design all their processes to be consistent with the image they want to portray, such as delivering on customer service, producing quality products, being socially responsible, aiming for sustainability, and otherwise responding to public opinion? Warren Berger: There will be great pressure on companies to do this, but not all will be able to do it, in my opinion. It is very hard for a company to "walk the walk." It's much easier to say one thing in your ads, and do another behind closed doors. The trouble is, those closed doors are being pried open – people have more information about companies than ever before. They're able to connect the dots in ways they couldn't before. In that environment, "what you do" starts to matter more than "what you say." This wasn't necessarily true in the glory days of Madison Avenue, when slogans ruled. VB: Would it become a marketing benefit if a company included in its annual report and on its website an audit report by an independent third party assessing its accomplishments in transparency, commitment to quality, consistency, and authenticity? Warren Berger: It wouldn't hurt. But the funny thing is the public is already auditing you as a company, probably better than any auditor. They find out when you're greenwashing. Or when your labor policies don't jibe with your "empowering" ad slogans. And they spread this information around. But the flip side is, they also notice and appreciate and talk about the good things a company does. They will become your ambassadors if you do the right thing. VB: '…a recession is no time to retreat. It's actually a time to… "steer into the skid," by finding ways to efficiently innovate and refine a company's products, services, and its overall operations.' How could a company "steer into the skid?" Warren Berger: It means you do the opposite of what the circumstances would seem to dictate. Instead of freezing and pulling back in troubled times, you take bold action. You try to innovate while others are standing pat. You make noise while others are being quiet. It's not easy of course, but if a company can do this it will stand out even more because everybody else is holding back. And it means you're then positioned and poised to do really well as the economy does come back. VB: "The inclination to ask stupid questions and to frame problems in new ways… is a big part of what makes a good designer good…" You also say "…experts are the ones least capable of asking stupid questions, because they know too much (or so they think)." Is asking stupid but relevant questions difficult to do? Warren Berger: It is extremely difficult. It goes against everything we are taught in school and in business meetings. We are taught that you're supposed to have the answers, and that you're never supposed to look foolish by questioning fundamentals. Yet progress, in business and elsewhere, often starts with questioning the most basic assumptions. Almost every design breakthrough featured in my book started with someone asking a stupid question. "Why are we doing things this way? Just because we've been doing it that way for 20 years, does that make it right?" VB: Where are the stupid questions found? Warren Berger: They are all around us, waiting for people to give voice to them. You find them by watching, listening, and paying attention to what's going on around you. And sometimes you have to tilt your head and look at things sideways, so that you get a fresh view of reality. VB: Many think being a designer or inventor requires creatively coming up with radical new ideas, but often it's a matter of making "smart recombinations." Does it help significantly if you are well rounded in your knowledge and life experiences? Warren Berger: Yes, because the more influences you have to draw on, the more raw material you have for "smart recombinations." I've noticed that great designers tend to have wide interests. They move between different industries and different worlds. They read constantly, and have eclectic, well-stocked minds. It has been said of the Pentagram designer, Michael Bierut, "His brain is a compendium… he absorbs everything and then uses what he needs at the right moment." VB: Can knowledge and expertise become a designer's "enemies"? Warren Berger: Sometimes – especially at the beginning of the design process. Because at that point, too much knowledge in a specific subject area, or too much advance research, can become baggage that weighs you down and keeps you from exploring offbeat possibilities. But gradually, knowledge and expertise becomes critical as you refine ideas and try to achieve the solution to a problem. Bruce Mau puts it well, "The idea is to be an expert coming out, not going in." VB: Designer Bruce Mau talks about "massive change." Should designers be focusing on "orchestrating experiences" for businesses, governments, and nonprofit organizations rather than on the design of "things." Warren Berger: There is room for all kinds of designers. I would say we don't desperately need more "things" – we're already drowning in stuff that is often disposable and not particularly useful. But we do need solutions to pressing problems. To the extent that more of our most innovative designers can turn their focus and their skills toward the latter, I think we'll all be better served. VB: "…it's not so much about making things pretty as making things plain." Is this a fundamental design principle? Warren Berger: Well, it's really just a turn of phrase I used to make the point that achieving clarity – the ability to take the world's complexities and make them simple, accessible, and "plain" to people – is one of the most important things good design can do. It's more important than dressing things up to make them pretty though it's really nice if you can do both. VB: Many products, especially those involving electronic technology, are complex to learn to operate, and the printed or online user manuals difficult to understand and use. Would companies producing these products benefit from applying the design principle of "forgiveness?" Warren Berger: Forgiveness – which is one of my favorite design principles – is about recognizing that people are human and will make mistakes, and planning for that in your design. Every system needs to be designed with forgiveness; otherwise the system breaks down as soon as humans screw up, which is inevitable. If you are designing a computer for kids, you must realize they will probably drop it, so you must design the computer to be able to withstand this. Likewise, you must recognize that people can be easily confused by technical language, so your manual should be designed with that in mind. VB: Given that the role of innovation and creativity is well known and understood, why have so many large businesses, nonprofit organizations, and governments lost their taste for "kissing frogs"? Warren Berger: Dean Kamen talks about the reality that as an innovator, you have to kiss a lot of frogs before you get a prince. And no one wants to kiss a lot of frogs, because it doesn't taste good. Plus, when outside observers see you kissing frogs, they may assume the worst – that you don't know what you're doing, and you can't tell the difference between a frog and a prince. There are a lot of social and market forces, and short-term pressures that conspire against the kissing of frogs. But it must be done in order to get to innovation. And in fact, the kissing of frogs – noble experiments that don't necessarily pan out – should be celebrated by companies and governments that purport to be innovative. VB: When talking about the "innovation gap," you say that if companies and the designers who work with them "can uncover and then satisfy unarticulated needs, the resulting products and services will tend to be innovative, distinctive, and coveted." Are there reasons for following this advice other than to make money? Warren Berger: Well, I think that if you produce stuff that is actually needed and that improves or somehow enriches people's lives, there is a psychic reward that goes with the financial one. When a company makes good stuff, people are proud to be a part of that company – so you end up with a healthier corporate culture. VB: "What matters is that [design research] becomes a bigger part of the business model at the many companies that have thus far remained too cut off from what customers want and need." Isn't it a surprise that this is not a fundamental operating principle in every business, irrespective of size? How have they survived otherwise? Warren Berger: I think many companies were able to get away with being insular because old business models and expanding markets allowed it. What mattered most was manufacturing efficiency and advertising clout. But markets change, and the world changes, and I don't think companies can get away with being insular anymore, for lots of reasons having to do with technology, more sophisticated consumers, stiffer competition, mature markets, and so forth. Many companies understand this now, but they still have to learn how to listen properly. It's like they've only recently sprouted ears and they still have to figure out how to use them. VB: You point out that it can be difficult, in large corporations, to create cohesion across departments and divisions – to work horizontally in a business culture that is vertical. How might designers help these organizations redesign their organizational structures and work processes to eliminate this silo effect, rather than accept it as endemic to large organizations? Warren Berger: Well, the designers can't necessarily break down those walls and silos. The people running the company must do it; they're the only ones with the overall authority. Designers can play a key role as facilitators in companies that move in this direction, because designers are often pretty good at working across disciplines, seeing the larger picture, and taking a more collaborative team-based approach to problem solving. VB: "A sketch or model of an idea seems to hit deeper than a verbal description of the same idea." Have you personally changed the way you communicate your ideas since learning this? Warren Berger: Yes, it took effect as I was working on the book. I began to create multicolored charts representing the book's evolving content – something I'd never done before on any writing project. VB: Given the ever increasing content on the Internet and numbers of people accessing the web as their primary source of information and data, does it surprise you that so many business and government websites are poorly designed? Warren Berger: We're still in the early stages of the Internet revolution, and the revolution was led by techies, not artists. So technical innovation still leads the way and artful innovation has lagged behind a little. Eventually, I think, people stop wanting "what's new" and they want "what's better," and that's when good web design comes to the fore. It's happening already. Even the U.S. government website has gotten a little better of late. VB: In your book you talk about a number of companies that have benefited from sound design. Which is your favorite example? Warren Berger: Well, there are the classics, such as OXO – probably my favorite because they took the world's most boring product, a potato peeler, and used design to transform that product and a whole category. I won't even talk about Apple because everyone is so sick of hearing about their dominance in design. Nike is a great design company. Among newer companies, Method soap. We may not tend to think of Google as a strong design company, but they are. Procter & Gamble is an example of how even a big, conservative company can use design to reinvigorate itself. Samsung showed that good design can quickly transform a low-end commodity brand into a high-end, classy one. VB: Are today's social activist designers, those working on such issues as poverty, population explosion, economic turmoil, dwindling resources, planned obsolescence, global warming, and the plight of many people in the developing economies, going to become an effective "world movement?" Warren Berger: It would be nice to think so. I do think there is both social and economic momentum behind this movement. People, governments, and even corporations are realizing that we have to try to design better ways of conducting ourselves in the world, or we won't have a world. And that ties directly to the profit motive, because, as someone in the book observed, "You can't sell stuff to dead people." VB: Following your immersion into the world of design, do you feel design can solve the world's problems? Warren Berger: Yes. But not all of them, and not in a grand, sweeping way. Design is already solving the world's problems – in small, incremental ways, often one village at a time. All those small, localized solutions can add up to big improvements in the way people live. VB: ‘Design that does "more with less" is needed more than ever in today's world.' Given, as you say, that extreme constraints motivate creativity, resourcefulness, and innovation to try to get close, even if not reaching the target, are we entering a new era of exciting design solutions for people at the bottom of the pyramid? Warren Berger: I think that's a huge area for design to make a difference in people's lives, while also opening up new business opportunities. I just hope that as designers begin doing more work geared toward the developing markets, they remain focused on paying attention to, and addressing, real human needs – as opposed to foisting stuff on people that is not essential or life-enriching, and that may not even be appropriate to the local culture. VB: You see a future role for designers in collaborating, through the Internet, to generate the right new ideas, and in facilitating the mobilization of those people who need to play a role in bringing about change through better design. Does this mean designers will be at the forefront of innovation in future? Warren Berger: Definitely, but not all of these "designers" will have gone to design school. We're entering a time when, increasingly, good design will be done by people who pick up the tools and adapt the principles on their own. VB: Does the process of design thinking, including "distributed possibility," give you hope that better systems will exist in the future? Warren Berger: I wouldn't want to oversell "design thinking" as a cure-all formula, but it's a methodology and a way of thinking that can certainly be helpful in taking on complex challenges. As for "distributed possibility," if more people have the tools and the shared knowledge that can allow them to be creative and tackle problems, they are bound to bring about improvements. Sometimes they may create new problems, too, but more often I think they'll be generating solutions. VB: You no longer have to be wealthy or even work in a large organization to have online access to these incredible design tools. This should enable ever more people to have glimmer moments. Warren Berger: Yes, and as we discussed earlier the key will be to turn those glimmer moments into actual realities. This is where the design process can be so helpful. VB: Thank you for talking to us about how design can transform business and maybe even the world. Author Warren Berger provides us with a wealth of information about design, having researched the thinking of many designers and others who have studied the essence of design. While he references designer Bruce Mau's ideas quite extensively, including Mau's "An Incomplete Manifesto for Growth," he includes the thoughts of many other designers and students of design, including his own. Warren Berger points out that extreme constraints, such as producing a computer for $75 US, are good because you will innovate merely by trying to get as close as possible to the objective within those constraints. He advises that while in the past the design industry has focused mainly on the needs of the few and affluent, it is likely time to "Design for the Other 90%." Make it cheap as a chicken. The chicken shall live forever – there is no garbage dump. One of the interesting pieces of research included in Glimmer is "…the older you get, the more you begin to think like a designer." This means we can design our lives so every day is interesting no matter how old we are! Glimmer includes five of the laws contained in Mau's manifesto as being principles of design: ask stupid questions, jump fences, go deep, work the metaphor, and begin anywhere. The book should be read in order to fully understand these and other principles, and there are many more reasons for doing so. After graduating from Syracuse University's Newhouse School of Communications, Warren Berger worked as a newspaper reporter, and then became a magazine editor and writer. For the past 15+ years he has been self-employed, writing nonfiction books, magazine articles, novels, speeches, and blog posts. Throughout his career, Warren Berger has been a leading journalist and author on the subjects of advertising and design. His writing about design has appeared on the front page of the New York Times Sunday Styles section, and his articles have also appeared regularly in the Sunday Arts & Leisure section of the Times. He has been a longtime contributing editor at the international design magazines Communication Arts, Graphis, and Metropolis. 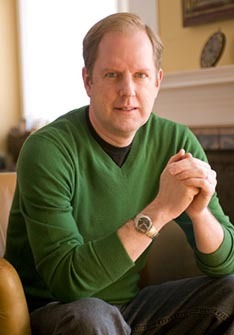 His writing on advertising and design also appears on The Huffington Post, where he is one of the featured bloggers. He has published more than 100 features and cover stories for the New York Times Magazine, Wired, GQ, Reader's Digest, Los Angeles Times Magazine, Business 2.0, and New York magazine. His work for Wired magazine was featured in the anthology book titled Best Business Stories of the Year (2001). He has appeared on television as a guest commentator on NBC's "Today Show" with Katie Couric, as well as on CNN and ABC "World News." On radio, he has been featured on NPR's "All Things Considered," as well as "Studio 360" and many other radio programs and podcasts. Warren Berger is also the founder and editor-at-large of One, an acclaimed national magazine focusing on advertising and design. He has a blog, which can also be linked from his home page. Warren Berger is the author of Glimmer: How Design Can Transform Your Life, and Maybe Even the World (2009), Hoopla (2006), and Advertising Today (2004), and is co-author of Nextville: Amazing Places to Live the Rest of Your Life (2008) and No Opportunity Wasted: Creating a List for Life (2004). Advertising Today was named one of the "Best Books of 2001" by Barnes & Noble, and in 2005 the Independent of London named Advertising Today one of the 50 all-time best books about media. No Opportunity Wasted was featured on "The Oprah Winfrey Show" in 2005.